The after-school program was structured around one-hour blocks, three days per week. This twelve-week program allowed for a progressive learning path divided into three parts; locomotion, sensors, and programming. 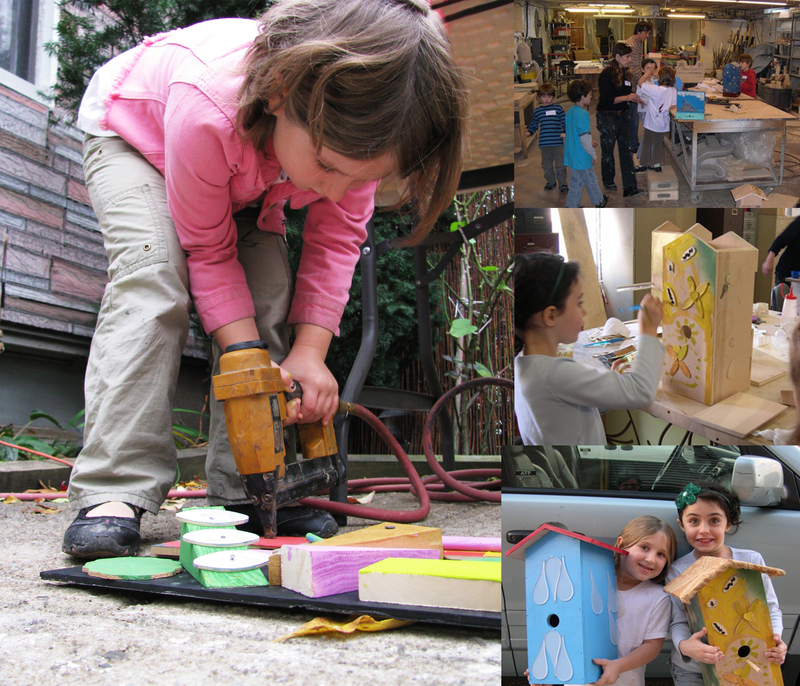 The curriculum design was based on a positive spirit of play, and an encouragement of experimentation. The initial phase utilized pre-existing robots like the Ozo-bot and Shpero. These tools allow a low hurdle of entry to the conceptual understanding of drive systems. Both of these robots function as learning tools which offer an initial passive engagement and then increase steps of participation to include motor control and navigational programming. The second phase of the class introduced sensors by beginning with an understanding of electronics. Starting from simple physical circuit design, the students became familiar with the process of an information gathering device which could provide feedback to change the action of other components in the system. We worked to make these abstract concepts concrete and relevant, with small simple projects related to the home environment. Then brought this together with a snap circuit kit which allows for multiple learning levels. The knowledge gained here was quickly transferred to the Lego Mindstorms EV3 and they could see the bigger picture of sensors in examples like the autonomous vehicle designs. The third phase of the class provided an opportunity for the students to develop a series of commands in the blocky language code, to control the Lego robot and accomplish a simple goal. With limited resources, the class was formed around 2 functional robots in teams and the lessons became a lively competition which fostered collaboration. While many of the aspirations of the curriculum design were accomplished, there were things the educators discovered along the way which became obstacles to growth, and opportunities for curriculum re-design. The students came the class with little or no experience. This was a bonus in some ways because there were no expectations or limitations from previous exposure. The after-school program allowed our educators to become confident in adjusting their game plan and becoming more sensitive to being adaptive to the student’s needs. The most difficult challenge we discovered was the time constraint. Each grade received a one-block of time per afternoon. This was too short to create a consistent engagement on one lesson. A mid-term change was made in the structure and the room was set up as a lab space, with several experiments happening in 3-4 learning modules located around the room. With this open framework, the lessons were to be in a random fashion which paralleled an organic flow of the student’s discovery process. This also opened the schedule by allowing the learning to be more interest driven, and the instructors gave more one-on-one lessons in an ad-hoc fashion. While this was not the original design, the program became more exciting for the students, and there were many self-directed learners who began to scaffold their own learning around their interests. This meant that some quickly became experts in “Shpero light shows” or another type of activity, and could share this new knowledge with others. In order to better design our curriculum to match the learning environment and time constraints in the future. Our organization now has pre-program survey process, which includes an on-site visit to observe and understand the learning environment and tailor the courses to fit each school’s students and form this into the after-school class from the start. The students of PS 165 had such a great time in the program that the attendance at the afterschool increased by 32% over the 12 weeks. They all felt empowered in their learning, and many of them had discovered a hidden talent for programming, this was especially true for the girls in the class. The professional development session was a one-hour long session with a series of quick steps to simulate the process by which designers analyze issues and challenges to derive solutions. In a workshop style format, we began by divide up into pairs, each partner representing a client, and a designer role, and this role alternated during throughout a series of steps. The steps represented the 5 phases of the design process; empathize, define, ideate, prototype and test, and the teachers performed an exercise within each step which simulated the actions of the designer, working with their client. These steps were short and forced participation without setting up the common barriers, and by alternating between the client and designer the Teachers were simultaneously challenged with giving and receiving. Which dovetailed into the problem they were solving, “How to create a better gift giving experience”. An example of this might be a woman whose daughter has moved away and cannot have that intimate experience of giving gifts in-person. Here the solution was a permanent packaging, like a road case, which contained a video recording function that allowed the giver to feel the experience of the receiver at that moment. This was achieved simply by creating a lid which opened and contained a fixture to hold a smartphone and a second lid which allowed the gift opening experience along with the moment of surprise to be transferred live via Skype, Facetime or Google Hangout. The special case would then return to the sender with an exchange gift for the other person. The big discovery for the workshop was the opening up of capabilities which the teachers didn’t know they had. The activity forced them to understand empathy as a key tenant of the design thinking process and it also demonstrated for them how critical this is for students to experience. The outcome of the professional development workshop gave the organization an opportunity to see through the eyes of educators who are on the front lines of very demanding role. Through this, adfabED is now confidently creating a curriculum which acknowledges the strengths of every educator in being able to direct students through uncomfortable challenges. The challenge of this project was the short time slot of the workshop. We overcame this with a large count-down clock which we used for each section. This allowed everyone in the room to be aware of this limitation, and they began to see this part as more of a game, eliminating the usual frustrations of not finishing their work. There were many participants who felt very stimulated by the experience and who were eager to try some of what they learned in their classroom, either integrating the design thinking process into existing curriculum or as a stand-alone function of learning design as a unit unto itself. The project was an open workshop activity of the Inventgenuity Festival and allowed young people to explore, at their own pace, disassembly of a common consumer appliance or electronics item. The open format allowed the less confident students to observe others, until they understood the tool usage, and felt confident to step up and try it on their own. The learning happened at all levels with some students having good dexterity managing to disassemble things to a very nano scale. The facilitators of the project became coaches of tool usage and explainers of the electro-mechanical systems and component functions, and also provided historical comparisons of the technology represented, as many of the items pre-dated the students own life experience. A big unforeseen discovery was that this historical aspect also became an engagement for the parents, as the old radios, and fax machines provided a nostalgic aspect that became a platform for them to talk to their children about moments from their own childhood. Many spoke about taking apart things when they were young and this created a parent/child bonding aspect to the activity. The project was a success in the high level of student participation and brought new connections to the organization through collaborating with the Beam Center. Additionally, adfabEd created an alignment with the educational mission of the Lower East Side Ecology Center in fostering an understanding of the need to promote re-use and safe re-cycling of electronic goods. The challenge of this project was the control of the area used for breaking apart stubborn plastic housings on the large electronic items. While this was a fun and popular part of the workshop, it also was a bit dangerous due to flying debris. The resolution was a large acrylic sheet which shielded the braking space from the detailed disassembly activity. The response from the student participants was overwhelmingly positive and they expressed with excitement, that sense of wonderment of what could inside at each level of the disassembly. For many students, this was the first experience with working on a “machine” and they became empowered with the idea that they were in control and felt free to fantasize they were going to fix the machine. The parents were also supportive of the activity and many suggested they would continue to do this at home with their children. Project goal: To introduce to students the industries of Design, Engineering, and Construction and provide an informational forum for discussing different aspects of these career paths. The connection with the S.T.E.A.M center has been inspiring for our organization because it recognizes that career education has an advantage when viewed through the structure of the S.T.E.M center programs, which encourages traditional education alongside career paths and exposure through internships. Engaging students to participate and speak during the sessions proved to be a challenge. Upon noticing this we broke the silence with having everyone to tell us about their most favorite, and least favored vegetable. Additionally, we created smaller groups led by the school teacher and adfabED which encouraged more discussions to happen. Many of the students came up to us with questions at the end, and these questions all related to finding the entry point for these career tracks. We felt this constituted a success because it indicated a trigger had been tripped with those whom this career resonated, and they were excited to get started. Project goal: To build confidence for students in the study of Robotics, through hands-on learning using digital fabrication, construction with basic tools, and computer programing language. The robotics program of adfab:ED partnered with Martel Design and Fabrication, to offer students full access to a state-of-the-art metal design and manufacturing facility, which allowed for anything they could possibly dream to become a physical reality. Equipped with tools such as; CNC water-jet cutting, laser cutting, 3-d printing, and metal forming processes, the students quickly became excited about the design process. The group would build a robot capable of performing in a FIRST robotics challenge. They studied the game tasks required by the robot and designed mechanical and electrical systems which were capable of performing in both autonomous and driver controlled situations, with the objective of completion of those tasks in a 3-minute period. The students were shown the basics of the robot drivetrain, various building, parts, and electronic controls and asked to work together to complete a working robot in a 3-month period. The initial phase of discovery was the design phase where students were required to make calculations relative to the playing field and translate this into a design. This provided an opportunity for the educators to outline the process of design thinking, which led to the students creating their own solutions to the problems in front of them. The group then worked as a team and made choices by consensus to outline a plan of action. The build process brought new challenges, like working with the aluminum construction materials, or inaccuracy in cutting or assembly which created issues with motors, or chain drives. Backing into a more considered construction, and building for durability, led to improved results. The android based communication also challenged the students as they worked though the programing stage, the connectivity, hampered the progress. By reaching out online to message boards and video tutorials, they were able to logically solve these roadblocks, and progress enough with the code to control the robot. For challenges not solved with standard build parts, the students were encouraged to design and fabricate using computer design software, and digital fabrication tools. The custom tire treads were water-jet cut from high-density rubber, and the phone cord holder was formed using 3-D printing. The students were immediately challenged in learning new skills, however, this was off-set with the regularity of the weekly program, and the small group learning environment which provided social integration and a sense of a larger team goal. This close environment also allowed some students to feel comfortable exposing their strengths and a willingness to share skills with others. Overall, the students each felt their work was valued by this membership in the group and began to feel ownership towards the team’s finished product. The organization gained tremendously from the joint partnerships of this project. Being able to see inside the highly organized structure of a large educational non-profit like FIRST, was also very useful to understand the value and necessity of this tight structure. 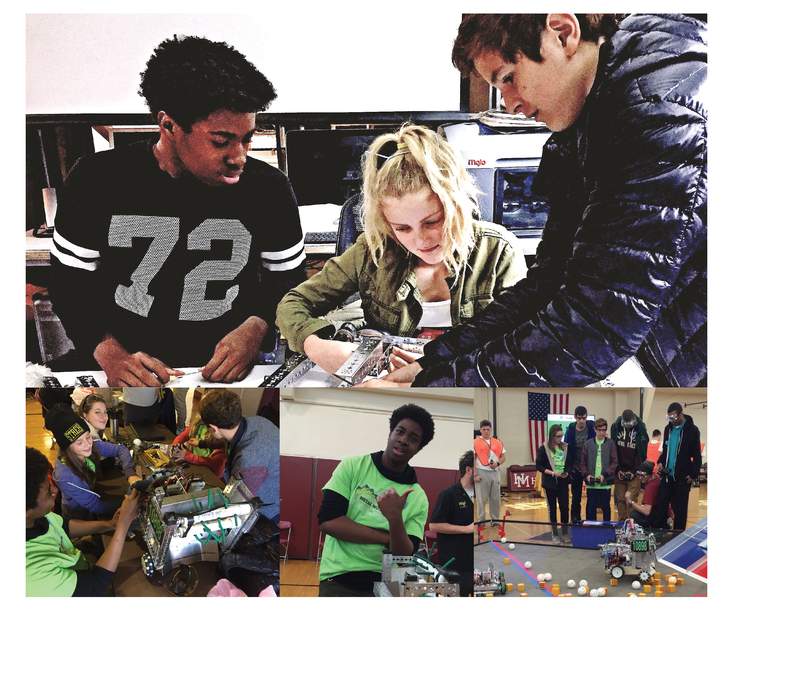 The organization now feels the value of robotics, in its ability to encompass so many diverse skills and lessons, and the powerful impact on student’s confidence. The administrators are now considering robotics to be a key part of the programs for adfab:ED. The program was successful after a rocking start in our solicitation for participants. With a desire for a diverse yet self-selected group, the distribution to local school principals was not sufficient, but this was resolved by postings on online boards and email circulation. The result was a group of mixed gender, and racial makeup drawn from three Brooklyn public schools. For some participants, there was initial frustrations, surrounding some of the physical challenges of building, or the patience requirements of programming. However, all of the participants felt accomplished in some way and felt compelled to stick with this after-school program each week. They all spoke about continuing to work together on another robot, which is a signal that this is a great way to keep them motivated to make school an important part of their lives. Target audience; A drop-in constituency age 5-15, local to the community of Williamsburg with a wide range of backgrounds. Project goal: To have students learn basic circuit design and a greater understanding of the role centrifugal force, and gain confidence with the self-directed making process. As part of the event Steamworks: A festival of curiosity the adfab:ED team invited students to participate in the construction of a simple motorized robot that posses the ability to draw unique patterns. Coached by a staff of facilitators the students explored the construction of a simple electric circuit wiring the parts together, and mounting the mechanical elements to the body. This project was outlined but self-directed in it pace and approach. This allows for discovery to occur and the community of students working together can enable each other by observational example, or direct assistance. The second phase of the activity involves exhibiting the personalized Draw-Bots in the Battle area. While the name suggests an aggressive completion, the gentle and quirky movements of the bots, created a friendly showcase of personal expression and wonderment for the variety of possible drawing patterns. Participants quickly advanced their STEM knowledge, covering electrical polarity, centrifugal force, balance, rotary motion, and trajectory. The concepts were discovered intuitively through the hands-on process of construction the Draw-Bots that encouraged a period of trial and error building to success. Additionally, participants gained a sense of ownership and were able to creatively express themselves. By embellishing the constructed Draw-Bots with items that create a humanoid likeness the students transferred themselves into the object, and this attachment played out in the battle area with the personality of the Bot’s motion. 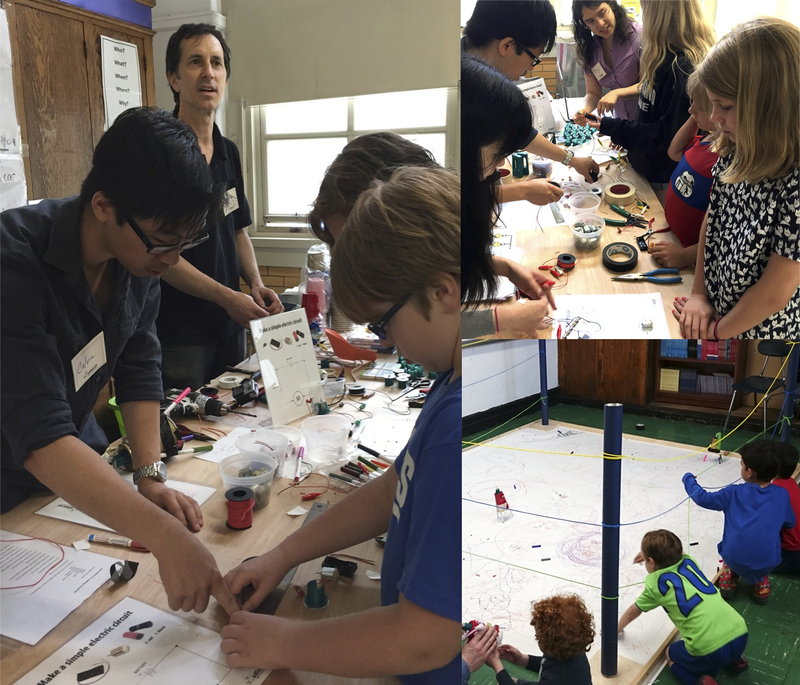 The participants quickly discovered that changing one of the variables in the leg length brought a new pattern creation capability, and this process would continue until they felt the motion and resulting pattern was a match for the personality they had given the Draw-Bot. The learned information from all of the discoveries the participants made was shared amongst each other in an informal “flash community” that occurred around the work tables. Throughout the course of the work day, the adfab:ED’s 3-D printer continued to develop printed motor mounts to hold the small DC motor on the Bot body. This allowed the students to see first hand the part making process and use them in a direct application of the project. The exposure to the digital fabrication process created a lot of wonderment and opened up the possibility for them to facilitate variations in creative design. What if we made a mount that put the motor sideways? – What if we had two motors mounted together? The inquisitive questioning of the approach is inherent to the Design Development practice and it was encouraged by the Facilitators, many of whom are designers themselves. The Draw-Bots project allowed adfab:ED to build its network of industry and education professionals like electrical engineers, and EdD candidates, who were able to provide mentorship for the young minds reminded the organization of this very important role that mentoring can play in a student’s self–discovery. This network is now an internal resource for the organization to build upon with future program development. Managing the number of participants was an initial challenge of the workshop, as the structure was on a drop-in basis so the rate of this could not be pre-determined. This was remedied by a distribution of the workflow process, and creating a module approach, where students could engage in constructing parts out side our linear sequence we had initially outlined. Additionally, we saw a need to create a simple queue system which held a waiting students position in the wiring station module while the worked on other parts, or were discovering the playful physics of the example Draw-bots in the Battle area. A large number of the younger age participants disused with each other the surprise of being able to build something on their own which could move under power. For the older participants, after discovering the outcome on the variables of the leg height, many were looking to take the project to the next level. There was a desire to add more action, and some students then chose to alter the flywheel element mounting to the motor shaft. This experimentation by the older participants gave more engagement as they could now interfere with neighboring Bots – which resulted in a wider variety of patterns. Target audience; Youth from low-income under-served communities throughout the Bronx, aged 11-15 enrolled in various summer camps. 95% of participants were Hispanic, Black, economically disadvantaged and/or English Language Learners. 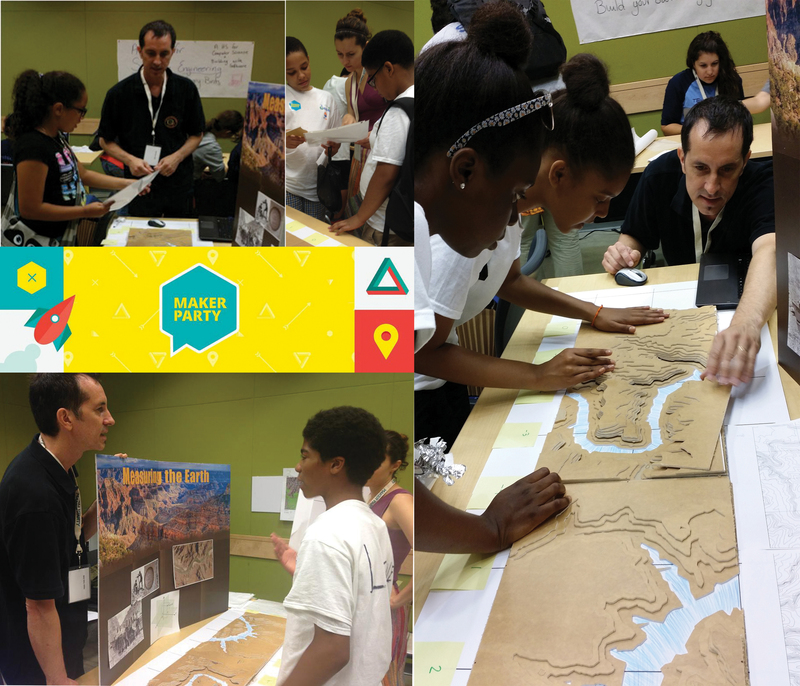 The Summer Quest Maker Party gave adfab:ED an opportunity to teach earth science from a different perspective, and invited youth to participate in the formation of the Grand Canyon’s unique features with the use of laser cut slices to show its topography in 3-D. The students were challenged to construct the Canyon’s shape starting from 6 million years ago, with individual laser cut acrylic shapes. They worked individually, but together in the overall metamorphosis of the canyon by mirroring geologic time with the time of the event, concluding the day’s build with a model of the present day 6,000 foot deep Canyon. The pieces were labeled with a set of coordinates, which corresponded to a system within the build area. The facilitators encouraged students to discover on their own the meaning to this code. They were given a diagram of the Cartesian coordinate system to guide the process and locate the correct position for the geologic puzzle pieces. The participants were immediately engaged with the project due to its visual intrigue. The tactile construction of the canyon was used intentionally to form this kind of connection and facilitate participation in the mathematics of spatial relationships. The students were for the most part familiar with plotting with a two-axis graph, but many were not familiar with the consideration of a third “Z” axis. This discovery was key to completing the puzzle match and became a discussion point for the facilitators to explore with the student’s additional reference material on the geologic survey process. The model in front of them slowly became the imaginary canyon, and when they began to see the scale of themselves in relation to it- the question of “how would you measure this place?” became very overwhelming. Great conversations were developed with the students in this moment of awe. We explained ratio as a fraction with the numerator being the relief model they were building (in inches), and the denominator being the same distance on the ground- times 24,000 or 1:24,000. We noticed that once the door was open for the use of math and measurement, we could raise more questions; What are the contour lines representing? What is the interval between the lines? This led back to the data that is needed to form a topo map’s contour lines and the Cartesian diagram. As we examined the USGS map, the students began to see the benchmark plot points and how they were similar to the coordinates we had given them in the puzzle challenge. The project was a great opportunity for adfab:ED to partner with Active Emergence, and mix with other affinity organizations from HiveNYC. Building this network has been key to facilitating our program growth. We gained tremendously from the collaboration, which allowed us the freedom to develop an original curriculum, without knowing exactly where we would end up. The digital fabrication component was a big draw for the students, and in future projects, this will become a more active engagement device, and the projects’ curriculum is now validated as useful in creating a basic understanding of 3-D spatial relationships, which are key to projects in a computer modeling workspace. The project provided a good insight into the experience of urban youth in relationship to nature, and this pre-disposition colored the learning material in a sometimes positive way, and other times negative way, as an un-relatable subject. We learned from this that future use of this curriculum would need to address the impact of this experience level. Perhaps a useful extension of the project would include partnering with another organization that brings youth into rural settings to increase awareness and confidence. Participant outcomes for the project were in keeping with the original objectives. Many of the students reported having a greater understanding of plotting coordinates and the three axis’s which define 3-D space. All the participants demonstrated an improvement in critical thinking, and stimulation of this process then created self-directed challenges outside of the project’s parameters. Project goal; To bring the student’s families into the community of the school and become a partner in learning math and science with their science with their child, and to make the school visible to the larger community of Williamsburg. The project was formed around the premise of cross-generational inclusion and co-working, so participants could only register along with an accompanying parent. These adults were requested to become mentors and engage in the process of building kites, with the shared goal of flying them the following day. 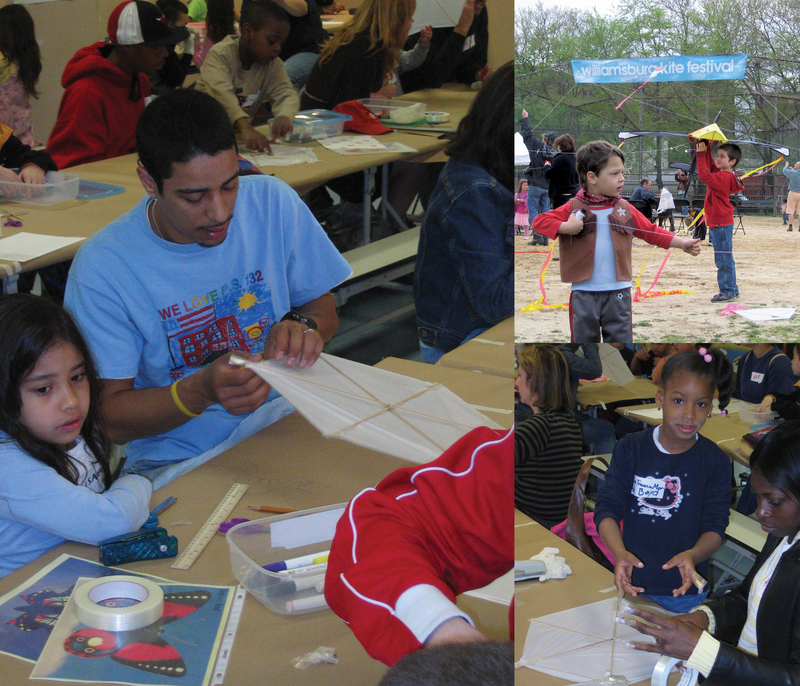 The activity was based on a simple kite design, which allowed a multitude of ages to be participants. We began by plotting a perfect hexagon on the plastic material. This challenge used an equilateral triangle to build the more complex hexagon shape. Mastery on this level gave the younger students a bit more reliance on their collaborative parent. However, the older students gained immediate confidence and took a lead on the project with their team members. This discovery of the various roles each participant has with each other, and the larger group environment developed and changed as we moved through the construction process. Some of the processes required more manual dexterity, and when this activity was supported and encouraged by their parents, the students became empowered by this achievement. The final step of “personalizing” the kites with makers, was the process that embedded ownership in the object they had made together and allowed the students to showcase their interests amongst the peer and parent audience. The physics of flight became an important part of the accuracy of the construction. This was explained with airfoil diagrams by the team of facilitators and volunteers, and while most of the students absorbed this – it would be in physical testing, with the adjustment of the bridle strings, that these principles had its true impact. The following day’s flying festival at the local park, allowed the project to expand to include other family members who formed an additional support network for the creation process – “Come see the kite me and dad made together.” Additionally, the group of students and families were now part of something in their neighborhood community –“look what our school did” and provided a showcase for them to be proud of their achievement. The project was a great exposure for the school in the surrounding neighborhood, and the culture within the school also benefited with the Parents participation. Some parents, who had never been inside the school building, were now understanding more about their child’s daily life, and the teachers they interact with. This connection is essential to strengthening the community of the school. Our organization grew tremendously from the scale of this project and some of the logistical challenges surrounding the festival portion. We are now better equipped and experienced to work with large group activities and have a greater understanding of the public permit processes for our future outdoor projects. The project’s largest challenge was stretching the boundary of what could be done in the school environment. The public school community was not accustomed to projects of this nature and it challenged the status-quo of learning- as being traditionally just in a classroom space during school hours. We resolved this challenge by slowly recruiting champions of the idea, and building a larger support based on those key people. The tipping point came at the sign-up process, where the kids showed, by overwhelming numbers, that there was a tremendous interest from them for this idea. The community then rallied after this point, in a spirited level of support, and volunteerism. The students and their parents were very vocal about feedback in overwhelming support. Additionally, the cross-generational success generated by this project became a pivotal moment for galvanizing the school under a mission to provide more progressive based learning programs. The kite festival part of this project has been adopted as an annual event with growing support from local business and corporations; it has anchored the school’s place in the broader community. adfab:ED developed the Imagination Factory Camp to introduce the learning by making model to Brooklyn students during unusual single-day school holidays The program centered around exploring problem-solving projects in a connected learning experience generally in the form of a field trip. In all activities, the participants would be challenged to use real professional tools, and this was a consistent place of growth and empowerment. Two of the most successful projects in the camp series were the Bird Houses and Kandinsky Relief Collages. During an exploratory field trip at nearby McGolrick Park, each student would decide between two common native birds the Sparrow or the Finch. This time outside gave the students a chance to understand the birds by observation and with the addition of worksheets, they learned the mating habits and other requirements of a safe home. This understanding helped during the planning and led to the proper measurement to construct the bird’s entry hole, and eventually the correct placement from the ground. The project was challenging- with the wide range of skill levels and ages, but the staff facilitators quickly adjusted to the student’s needs. Those students who had better building skills also began to assist their peers. The students reviled in the idea that they had created something functional and the embellished personalization of the houses, made the day to end with a lot of expression and pride in the completed works. This project’s goal was to form an understanding and appreciation of the work of Wassily Kandinsky through an in-depth tour of the exhibition at the Museum of Modern Art and to then create a personal 3-D relief inspired by the artist. The study of his use of geometric forms and color in a balanced composition, was in effect as the students worked with scraps of wood, and plastic. Many of the materials require special attention and tools, to be edited or manipulated, and that lead to allot of confidence building skills with the use of the real power tools. The final component was learning communication skills in a formal constructive critique format.